Year 2011 is gone and we have entered the second year of the second decade of 21st century. Team Wheel-O-Mania would first like to thank all our readers for their kind support, sending in the scoops, spy images, their queries, videos of their own. Your support and love to us and your passion for cars has made us more strong and eager to let you Updated with happenings in Automobile Sector across the globe. Year 2011, we would say was a year with mixed feelings with sentiments across the sector started on a very positive note but slowly growth stagnated and is now showing the signs of entering into the negative turf. Though, we had some amazing happenings in the Auto Space including New Vehicle Launches like Mahindra XUV5OO, Force Motors entry into passenger segment by launching Force One and many more along with major policy changes across the space which i am sure has given all of us great learnings and experience. We also saw major investment plans of some OEM like Peugeot, Ford & Maruti in Gujarat and some delayed plans like Maruti's Diesel engine plant etc. With all the mixed feelings for the year, we bid adieu to 2011 and enter a new year with 2012 Auto Expo coming in and will hopefully provide clarity on future direction and will give impetus to the Asia's most potential automobile market. 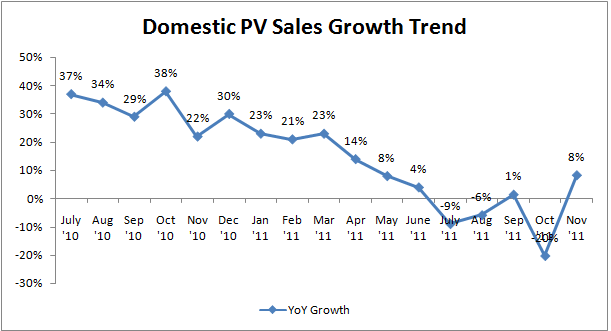 Below is the recap of happenings in Year 2011 which have/will impact the Automobile sector. Revision of Repo rates, 7 times in year 2011 by a cumulative impact of 225 bps. The Repo Rates have increased 13 times since March 2010 leaving a cumulative impact of 375 bps. Growing Fiscal Imbalance - Fiscal deficits for Apr-Oct 2011 stands at 75% of BE as against 42% for Apr-Oct 2010. Revenue deficits stands at 79% of BE for Apr-Oct 2011 as against 34% for Apr-Oct 2010. Trade deficit grows at $93.7 Bn for Apr-Oct 2011 as against $72.8 Bn for Apr-Oct 2010. Inflation remained stubbornly high for almost two years now. In October 2011, WPI inflation ruled above 8% consecutively for 22nd month and above 9% consecutively for 11th month. Reduction in share of India's Largest Auto maker, Maruti Suzuki to current 38% from earlier 46% in FY08. Reduction in Market share of Exports of Hyundai and Maruti by substantial amounts whereas gain by Nissan and Ford. 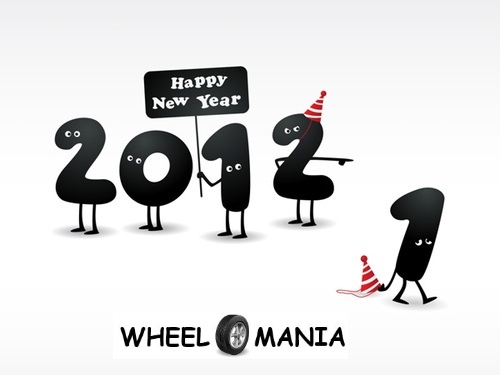 With all the mixed feelings of positives & negatives we bid adieu to 2011 and welcome 2012. We hope that the hiccups during the year gave us memorable experiences for our lifetime and has made us strong to face such situations during the year. Contact us for the detailed report "Year 2011 in Flashback"
If you have not joined us, Follow us now to get Latest Updates on Automobiles across the Globe. Have you seen the New Skoda Rapid TV Commercial ? Have you seen the New Porsche Boxster Video ? Anybody dreams of a A-Star Cabriolet ?